I love… LOVE Christmas. In my book, Christmas cards are an opportunity not an obligation. It’s a chance to show a little bit about our family and what’s going on in our lives currently. Oh, and sometimes Christmas greetings come in the form of a video. Joy & Peace / Love & Chaos - double sided card to show juxtaposition of Christmas perception verses the reality. In 2016 our family created a Christmas video to share news with a surprise ending. 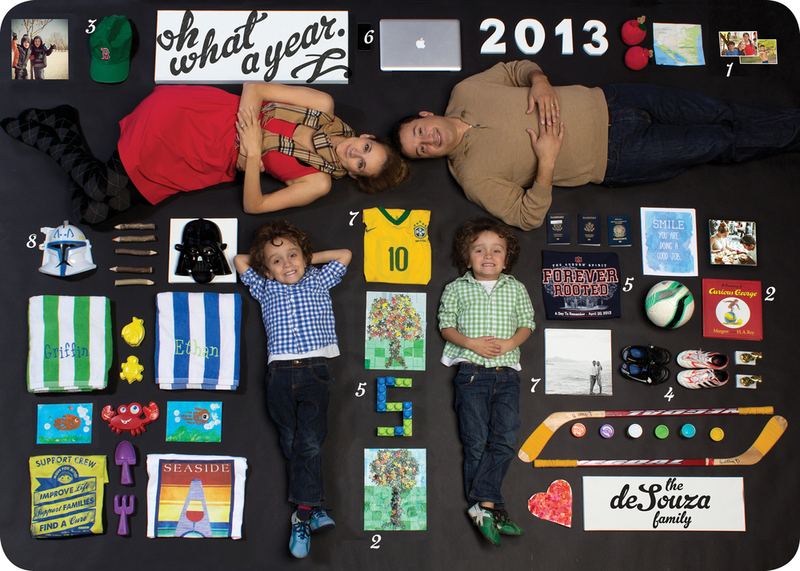 Our 2013 Holiday card was inspired by images from http://thingsorganizedneatly.tumblr.com. And after a couple friends ask me questions like.... did you give your kids whiskey? Or Did you just have to photoshop that whole thing? I decided to share a quick version of what our shoot looked like by sharing this little video made of our test shots. Hope you enjoy and Happy New Year. The little white numbers on the front connects with a noteworthy event from 2013, listed on the back of our printed card.